Agencies responsible for removing abandoned and sunken boats told KGW they don't have enough money. PORTLAND, Ore. — All week, KGW has been investigating the toxic, broken-down boats that Portland's homeless are living in on area rivers. All around boat docks on the Columbia and Willamette, you can find many boats half-sinking into the water. Most are leaking toxic chemicals. Agencies responsible for cleaning it up told KGW they don't have enough money. KGW found another flotilla on the Swan Island Boat Ramp in Portland's industrial and shipping area. It gets fisherman out to the Willamette River. But the unknown oil-like blobs floating on the surface, and the sinking dilapidated boats riddled throughout the lagoon don't make it inviting. "That one's been there awhile," said A.J. Kolar who works on Swan Island. We showed him photos of the boat ramp, but he knows the problem well. "It doesn't make me mad. It's more disappointing. It's everyone's river, it's everyone's beach. But it's just a part of Portland now. I just see it as like a normal thing now. It's gotten to the point where it's not even frustrating anymore. It's just like, it is what it is," said Kolar. Jim Garrett also works on Swan Island. We showed him the condition of the boat ramp area. "I think it's horrible. Portland and really Oregon in general, is such a beautiful place and I can't understand why that's being allowed," Garrett said. "I'm surprised the EPA or somebody hasn't come out and said, 'You can't do this anymore.'" On the Columbia River, at Chinook Landing Marine Park near Troutdale, there's a half-sunken sailboat that a transient used to live aboard. It drifted into rocks last month, and is now left abandoned and sideways. About 100 feet away from it, another boat is anchored. The boat was taken over by a homeless man who Multnomah County Sheriff's deputies say had to scoop water out of it daily to keep it afloat. When he drowned in 2017, while kayaking back and forth to shore, it sank because no one was on board to scoop the water out. Now, two years later, that 32-foot vessel still sits right there under the surface, leaking toxic chemicals. It's the Oregon State Marine Board that pays contractors to haul the boats. Normally it costs between $8,000-$15,000 to remove and salvage many of the boats. However, the bid just for that boat is $60,000. That's 40 percent of the Marine Board's two-year salvage budget meant for the entire state. It's why it hasn't budged. "So when you take into consideration that we have 60 to 80 vessels out on our waterways on any given day in similar condition, and you start doing the math, $5,000 for this one, $8,000 for that one, $60,000 for the other, things add up extremely quickly," explained Sgt. Stephen Dangler with the Multnomah County Sheriff's Office. Tow companies don't want to help because there's no value in fiberglass boats. It costs thousands just to take them to the dump. The sheriff's office does incur the cost in its budget to salvage a few of the smaller sunken boats each year. They also receive grants from the Marine Board to do boat turn-in programs where broken-down boats can be turned in for a couple hundred dollars to be disposed of responsibly, instead of paying the much higher fees of a scrapyard themselves. Nobody wants to pay a lot of money to throw something away, so they're instead leaving these worthless boats on the streets for free, where homeless people can drag them back into the water. 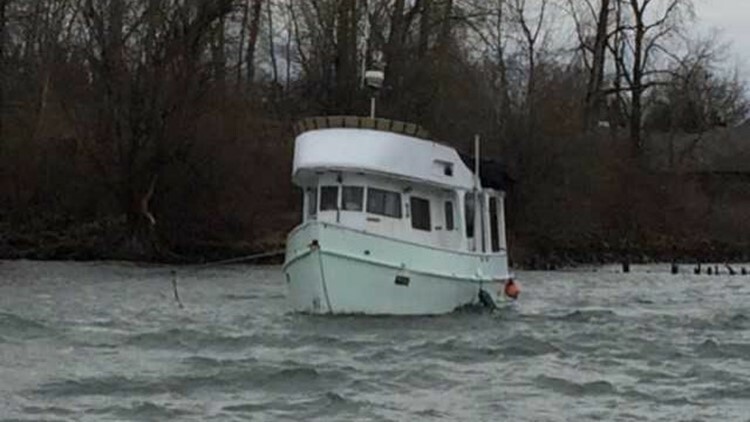 The Department of State Lands, which has jurisdiction over the waterways, told KGW since 2016, only five of these derelict, illegal transient boats have been seized. Sgt. Dangler says in a perfect world, there would be enough money to go out and clean them all up. It's a losing game with nobody to be held accountable. "We do issue a number of citations but they don't have a whole lot of teeth because nobody's paying them and people don't care," he said. There is a plan this year between the Multnomah County Sheriff's Office and State Lands to get more aggressive in the penalties. But so far, nothing rises to the level of arresting someone. We'll keep following this story.